This mod improves the Skirmish AI to be more tactical, and rebalances gunplay and functionality of the guns. Now includes the AI Improvements separately for those that don't want the weapon rebalances. SAIGO now comes bundled with it's own launcher for easy management of the mod. 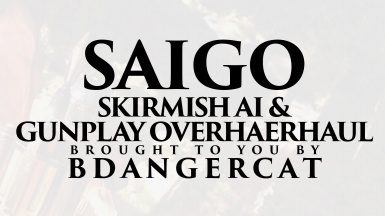 The launcher will update the mod whenever I push out an update, meaning that everyone will be on the same version of SAIGO. This new gamemode has been added as an option when launching SAIGO. This will replace Skirmish with an endless battle across the entire map. This mod allows for the loading of Walker Assault and Fighter Squadron maps without AI, objectives, or boundaries. .Cinematic Mode is designed for people that want to make Battlefront videos without being pestered by the AI or gamemode objective, people that want to test mods, or people that simply want to look at DICE's amazing work. SAIGO is integrated with BDangercat's Hero Blast mod. Play Hero vs Hero deathmatches with up to 12 friends, or use the built in lobby finder to search for other people to play with! Improved pathfinding: AI will now plan routes using more advanced tactics based on the location of the enemy and friendly team. When the AI loses site of an enemy in a fight they will now actively seek out their target. AI Cover System: The AI will now try to make use of map geometry to shield itself from incoming fire. Squad groups: The AI will now move in loose groups in order to strengthen their numbers. Suppressive fire: AI enemies will now try to use supressive fire to force you out of a position. Objective support: The AI will now make a much larger effort to support the objective. This involves activating uplinks and shooting at AT-ATs. Friendly ships will now also attack the walkers. The AI Shotgun class has had their shotguns swapped out for the EE4. This is because the AI is mostly useless with the shotgun. The Launcher class is now able to use it's smart rocket on human players at any time. It has lower damage output to make it a little less frustrating to play against. The Launcher class now also has the choice to spawn either with the reworked Bo-Rifle, or with the reworked TL-50. The Imperial Shocktrooper class will now use the reworked T-21 alongside the DLT19 in place of the RT97c, and the Rebel Heavy class will now use the RT97c alongside the DLT19. No more 1337 aimbot AI ship strafing runs: The ship AI has been modified to reduce the accuracy, duration, and target distance of their strafing runs. No longer will you be turned to dust by the insta-lock Faze clan tryhard ships. Health Rebalance: The Imperial Shocktrooper and Rebel Heavy now have increased health to counter for their slow movement. Imperial and Rebel Scouts now have slightly reduced health to counter their increased damage output. AI Rebel Special Characters: In every match the Rebels will be joined by one of their leaders. These leaders have slightly buffed stats to make them more of a challenge. Leaders are an attempt to counter somewhat for the Imperial advantage on most maps. All weapons have been rebalanced or reworked in some way. Extensive testing and live data gathering (using the launcher) has been done to ensure that it's a fairfight (heh) for everyone. EE4 Rework: The EE4 is now a close range automatic rifle with. It is highly effective at close quarters combat, but it's effective usefulness drops rapidly over distance. E11: The E11 is now as it is in the films! It is now a semi-auto marksman rifle with medium damage at mid-range. BO-RIFLE Rework: This is now a two shot burst weapon. It is designed to be used as a semi-auto sniper at medium to long range. It's damage increases with range so that it cannot be used as a close-quarters weapon. TL-50 Rework: The TL-50 is now a close-range shotgun with a concussion grenade launcher. The bomb splits into 5 smaller bomb mid-air to rain down upon your enemies. T-21 Rework: The T-21 is now a heavy machine gun with a low rate of fire and high damage. It is most effective at medium range. A180: Pistol: Rate of fire decreased, maximum damage increased. Rifle: Rate of fire increased, damage decreased. Sniper: Effective range is now much further from the player. A280C: Rate of fire increased, damage increased at close range, damage reduced at long range. Bryar Pistol: Rate of fire increased, maximum damage increased, Secondary Fire auto-guidance radius increased. CA87: Rate of fire increased, damage decreased slightly at close range. DH17: Rate of fire increased, close range damage increased, long range damage decreased. DL18: Rate of fire increased, close range damage increased, long range damage decreased, effective range reduced. It's model has been replaced with the Stinger Pistol. DL44: Rate of fire decreased, close range damage increased, long range damage severely reduced. DLT19: Rate of fire decreased, damage increased, long range damage decreased. DLT19X: Rate of fire decreased, close range damage decreased severely, long range damage increased, projectile speed increased. DT12: Rate of fire decreased, damage increased, effective range reduced. DT29: Rate of fire increased, close range damage decreased, long range damage increased. EE3: Bursts per minute reduced, close range damage decreased, long range damage increased. Relby V10: Effective range increased. RT97C: Rate of fire increased, effective range increased. SE14C: Rate of fire increased, bursts per minute increased, effective range decreased. T21B: Rate of fire decreased, close range damage decreased, long range damage increased. X8 Night Sniper: Rate of fire increased, damage increased. Skin customization within the launcher. Capitol ships closer to the battlefield. Many more changes are to come. My focus has now shifted to working on the AI now that the weapon rebalance is complete. Please bear in mind that this is a work in progress, and nothing is final.